Home  Welcome to fbForth.StewKitt.com! 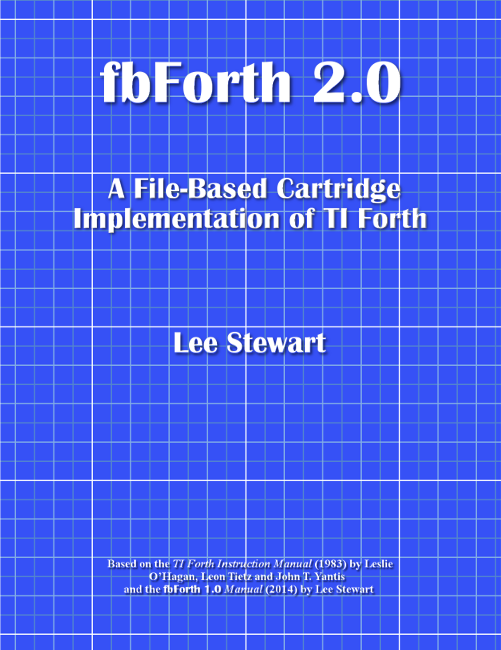 This website is all about fbForth, a file-based implementation and augmentation of TI Forth. It is simple to make a system disk of any larger size and density by just copying the system files to the new (usually larger) disk. If there is filespace on the system disk, you can save other useful programs there, such as CorComp’s Disk Manager, without fear of corrupting the system disk. There is no danger of corrupting a disk by saving Forth blocks—they are only stored to the current blocks file. One can use disks of different sizes with impunity. The only significant disadvantage that comes to mind is not being able to use the new system with the old. The viewer/copier utilities, mentioned above and included in the latest FBLOCKS file, render that merely an inconvenience. There is also a slight performance penalty to reading 8 records one at a time instead of 4 sectors all at once for each block read. This is somewhat mitigated by saving 896 bytes of VRAM. Shown in the animated GIF to the left are the opening screens with the fbForth 2.0 cartridge plugged into the TI-99/4A computer. Boot screens for both 40-column and 80-column text modes are shown in blue on white. The last screen is in 40-column text mode in white on blue with instructions on how to do that. The 80-column text mode is only possible if the TI-99/4A is equipped with Matthew Hagerty’s F18A (avail­able on his website) or V9938 and V9958 Video Display Processors (VDPs).available for the Peripheral Expansion Box (PEB) on SNUG EVPC and DIJIT Systems AVPC cards. See Mainbyte for examples of the SNUG and DIJIT cards.